Kate Just 2013. right: hand knitted merino and bamboo yarn, cotton, rayon, steel. Work including steel frame is 220 x 90 x 65 cm; Photo by Catherine Evans. Kate Just is represented by Daine Singer. Kate Just was born in Connecticut, USA in 1974, and migrated to Melbourne in 1996. She holds a Doctor of Philosophy (Sculpture) from Monash University, a Master of Arts from RMIT and a Bachelor of Fine Arts (Painting) from the Victorian College of the Arts where she has been a Lecturer in Art since 2005. Kate’s work spans a diversity of media including knitting, resin, clay, collage and photo-media. 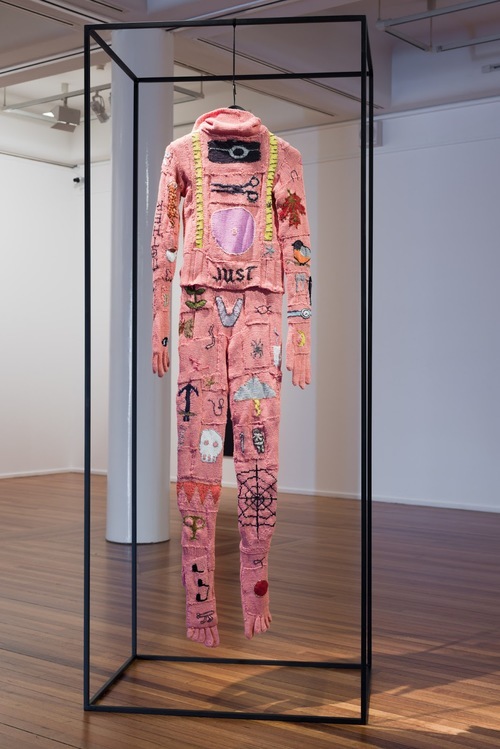 Her works feature figures, large text sculptures, abstracted forms and collections of knitted skins, tools and armours. A focal point in her practice is the development of representations of the body and womanhood that embrace subjective, embodied and multifarious perspectives. 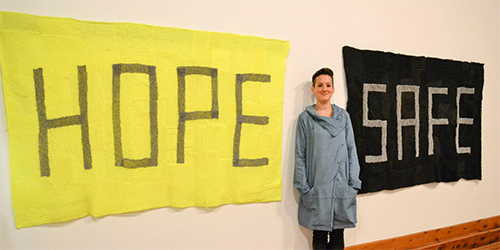 The use of knitting across works casts craft as a highly engaging sculptural medium, a poetic or political tool. Recently, she has also produced a series of socially engaged projects and public works about urban community, female representation and violence against women. Kate has exhibited extensively in solo and group exhibitions across Australia including at Daine Singer, Craft Victoria, Gertrude Contemporary, West Space, Conical, Centre for Contemporary Photography, Melbourne Art Fair, Silvershot, Contemporary Art Space of Tasmania, Chalk Horse Gallery, Nellie Castan Gallery, First Draft, MOP, Perth Institute of Contemporary Art, and Canberra Contemporary Art Space. Internationally, she has exhibited her work at Nanjing University, Auckland Art Fair, AC Institute New York, and the Factory at Kunsthalle Krems, Austria. During 2015-16, Just will exhibit her work internationally at Gallery Titanik in Turku, Finland, Chasm in New York City, and Youkobo Art Space in Tokyo, Japan. This entry was posted in Issue 15, Kate Just and tagged AC Institute New York, Auckland Art Fair, Burial Suit, Canberra Contemporary Art Space., Centre for Contemporary Photography, Chalk Horse Gallery, Chasm New York City, Conical, Contemporary Art Space of Tasmania, Craft Victoria, Daine Singer, First Draft, Gallery Titanik Finland, Gertrude Contemporary, Melbourne Art Fair, MOP, Nanjing University, Nellie Castan Gallery, Perth Institute of Contemporary Art, Silvershot, The Furies, Wangaratta Contemporary Textile Award, West Space, Youkobo Art Space Tokyo by Mark Roberts. Bookmark the permalink.